Cornwall has appointed its first Great Trees Officer to protect the county's ancient trees. It is part of a three-year study to find and record "significant" trees with long and unusual histories. The project is the work of the Cornwall Ancient Trees Forum, funded by groups including the National Trust and Heritage Lottery Fund. 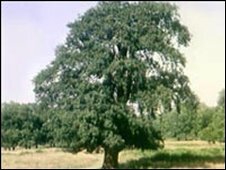 A county-wide tree hunt, involving local people, will be launched later in the autumn. Brian Muelaner, the National Trust's Ancient Tree Advisor, said: "There are very old trees and trees with cultural and religious significance. "I know there are trees along the coast where World War Two soldiers, whiling away time before embarkation, carved their initials into the trunks. "Cornwall has very strong Celtic roots, there are still trees next to natural springs which modern pagans decorate or 'dress'. "And of course young lovers carving their names in 1850 or so and others following suit, so some trees are covered. It's part of our culture." The new Great Tree Officer, Dr Loveday Jenkin, will work alongside local parish groups to make an inventory of Cornish trees. They also hope to form a network of tree wardens across the county.